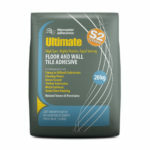 Kerakoll Bio Fast Is a mineral tile adhesive with an extremely low chemical additive content. 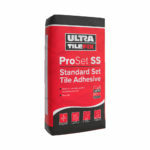 It features longer workability with accelerated adhesion for high performance bonding – with no vertical slip – of porcelain, ceramic and natural stone tiles. Kerakoll Bio Fast sets in 3 hours, ready for grouting. 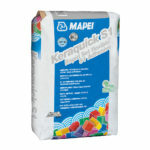 Kerakoll Bio Fast Tile Adhesive is available in white or grey, in 25kg bags. Bulk price discounts also available – please see above. 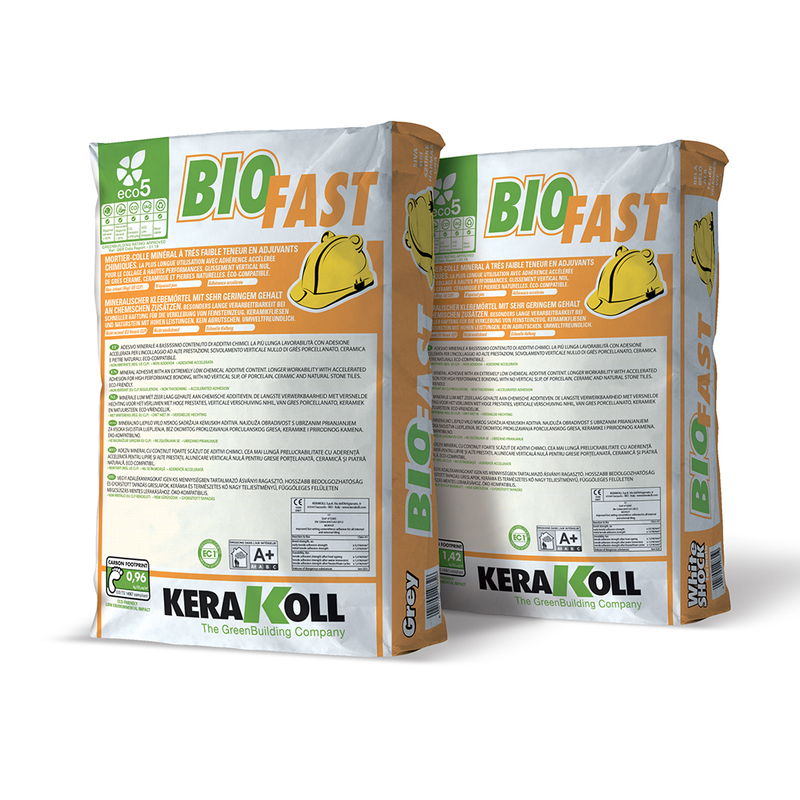 Kerakoll Bio Fast includes the mineral bentonite, this makes it highly thixotropic which means that it holds its shape and thickness under the tile. Kerakoll Bio Fast also includes natural NHL lime, this prevents thickening ocurring in the bucket and reduces the use of chemical additives. This equates to up to 1 hour of constant workability. 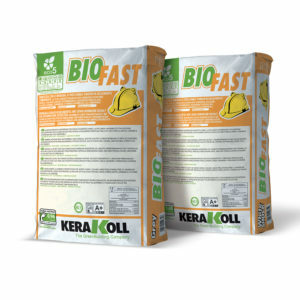 Kerakoll Bio Fast is ECO friendly, formulated with locally-sourced minerals meaning lower greenhouse gas emission during transportation, and contains recycled minerals thereby reducing the damage to the environment caused by extracting pure raw materials. Kerakoll Bio Fast Tile Adhesive doesn’t cause any irritation with bare hands, and has no environmental hazard rating. Kerakoll Bio Fast Tile Adhesive is suitable for the following substrates, materials and uses. All substrates must be level, cured, undamaged, compact, rigid, resistant, dry and free from any debonding agents and from damp rising (x UK) – All surfaces must be leveled, cured, undamaged, compact, rigid, resistant, dry and free from any loose particles and damp rising (x INDIA). It is best to apply Primer A Eco on very absorbent cement-based substrates. Anhydrite screeds must have a residual moisture of ≤0.5 CM% and ≤ 0.3 CM% in the case of radiating floors. 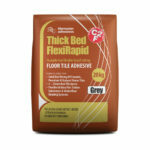 Cement-based screeds must have a residual moisture of ≤ 2 CM% and ≤ 1.8 CM% in the case of radiating floors. The amount of water to be added, indicated on the packaging, is an approximate guide. It is possible to obtain mixtures with consistency of variable thixotropy according to the application to be made. To guarantee maximum adhesion it is necessary to apply a layer of adhesive sufficient to cover the entire back of the coating material. Large, rectangular sizes with sides > 60 cm and low thickness sheets may require adhesive to be applied directly to the back of the material. Check samples to make sure the adhesive has been transferred to the back of the material. – every 8 metres in long, narrow applications. Respect all structural, fractionizing and perimeter joints present in the substrates. Correction time (BIII tile): +23 °C ≥ 6 min.